Product #60820 | SKU S450-M | 0.0 (no ratings yet) Thanks for your rating! Monitor high-resolution signals in the field with the portable FeelWorld S450-M 4.5" On-Camera Monitor. 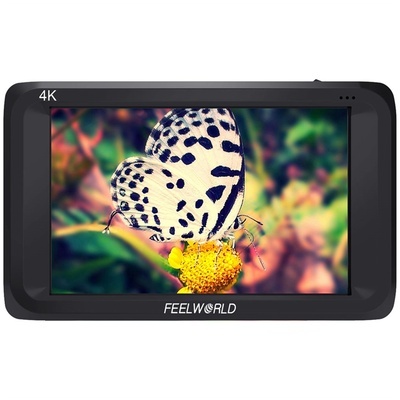 The FeelWorld S450-M 4.5" On-Camera Monitor monitors high-resolution signals in the field. Using the HDMI 2.0 input, 4K signals (either UHD or DCI) from your mirrorless, DSLR, or digital cinema camera can be displayed, as well as HD and SD signals. Broadcast cameras and professional equipment can be connected to the SDI input. An SDI loop output ensures that the signal chain can continue beyond the monitor. The 1280 x 800 LCD panel itself sports a 470 cd/m² brightness rating, and a 900:1 contrast ratio. IPS technology is implemented in the panel for vivid colours and wide 160° viewing angles. Essential monitoring tools such as focus peaking, pixel-to-pixel mapping, markers, and more are built right in. A Mini HDMI to HDMI cable, shoe mount, and NP-F battery plate are included.